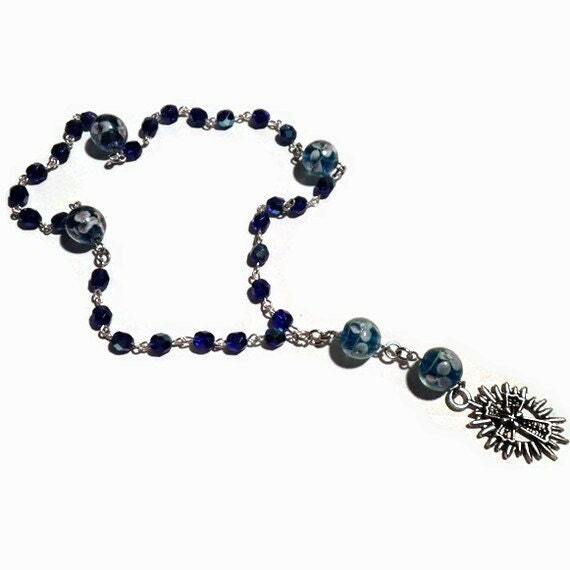 Cobalt Blue Anglican/Protestant Rosary..click to check it out at the shop! Hi Tammy from "Righteous Rosaries & Gifts" writing to you! I met a new friend online and somehow through a bit of a tough beginning of our friendship, we hit it off and became friends very fast. She gave me some food for thought, that I had lovely products, but what about the rest of us, like our brothers and sisters of the Protestant faith. She suggested that I make bracelets and prayers beads for my next projects. Her idea for the bracelets was to call them "Faith Bracelets", I loved that idea. Eager to please and delve head first into a new market area, I made this Christian Rosary last night. 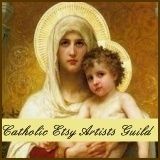 I turned out to be easy and I copied the instructions from a fellow Rosary Artisan. Voila, in my hands was a lovely 6mm cobalt blue AB czech beads with 10 mm lampwork paters and a tibetan silver cross. The picture is the finished product. What do you guys think of making not just Catholic, but also Protestant products? I think if we can encourage prayers, they it all goes to the glory of our Lord! Introducing my latest rosary. Made with white cats'eye (fiber-optic) beads for the Ave's spaced with pink sead beads. The Paters are lampwork beads with tiny pink roses on them. Surrounding the Paters are fuchsia bicone Swarovski crystals. The centerpiece features an image of our Blessed Mother in all her beauty. It was handmade by the artist using a resin technique. The crucifix is a double cross with crucifix on cross and is double sided with a heavy feel. It is hand cast in heavy silver plate from an old design. The ends of the cross have tiny fleur-de-lis design. A very nice crucifix. Thank you Mary for saying yes to our Lord!